What is management system integration? In this article taken from the August 1998 edition of Quality World, David Hoyle, an international quality management consultant and past Chairman of the CQI Publications Panel answers some pressing questions about Integrated Management Systems. (Note the date - this article is as valid in 2018 as it was in 1998). QW What is an integrated management system? DH In a pure sense there is no such thing as an integrated management system as it suggests that we can have disintegrated management systems. Although companies have a management system or in other words, a system for managing the business, it was not until we started to formalize this system using standards such as ISO 9000 and ISO 14000 that it began to take shape as several different systems. In the old days when things didn't work the way we expected and there was no one to blame we blamed the system. I cannot recall ever referring to it as any particular kind of system or even hinting that there was more than one. QW Are you saying that in general, companies have one management system but national standards have caused them to create several separate systems? DH In effect yes. Before national standards for different types of management systems emerged a company would have one system that had many functions. Some of these were documented and some were not. Often these were based upon departmental or functional practices. On paper it wasn't a system just a collection of practices. But in reality, there was a system that consisted of custom and practice. Most of it was not written down but it worked because of the skills, knowledge and working relationships the people developed and put into the business. Management style meant that it was quite fragile in some organizations and strong in others. Change the people, the processes or indeed anything and stability could not be guaranteed. Today's world is changing much faster than 50 years ago and hence we cannot rely on informal systems to reach our goals except in very small businesses. QW Does the size of a business determine whether its management system should be formalized? DH. If by size you mean turnover, or physical dimensions, then 1 would say no; but if you mean size in terms of the number of employees then, yes, size is a factor. Actually it is the number of relationships that determine the need to formalize a management system. I include external customers and suppliers in this equation. Even a sole trader will need a formal management system if there are several relationships involved in supplying the product or service. DH. Oh yes. Complexity is one very good reason to formalize. Others are high staff turnover, high number of operating sites, variations in market conditions, or just simply the variety of the products or services offered. One product, one customer, no suppliers, one person businesses do not need to formalize their systems, although I would expect opinions to vary on this one. QW So getting back to my question about integrated management systems,' it seems from what you say' that had the national and international standards addressed the whole business without being specific about elements of the business such as quality, or environment, we would not now be seeing an increasing interest in integrated management systems. DH Exactly. But we cannot turn back the clock and don't forget there were good reasons for approaching it the way we did. Getting companies to formalize their management systems all in one go would not have been successful. There had to be good business reasons for doing a part of it yet alone all of it - and there still have to be good business reasons. These reasons are becoming common to all companies in what is now a global market. QW So an integrated management system is merely putting all the pieces back together again? DH Not quite. To understand what an integrated management system is we have to examine the terms. Integrated means combined so in this sense it is putting all the internal management practices into one system but not as separate components. Think of the opposite word; disintegrate. If something disintegrates it shatters into tiny pieces. However, it was once whole and therefore for something to be integrated it does not just sit next to the other components it has to be fixed to the others so as to make a whole. Therefore putting the financial system, the quality system, the environmental system into one book of policies and procedures is not integrating them. Putting the quality manager, safety manager and environmental manager in one office or one department is not integration. Even creating one national standard for management systems is not integration neither is buying a software package that handles quality, safety and environmental documentation. For these systems to be an integral part of the companies management system there has to be linkages so that you can't see the join. The notion of separate systems disappears; even the terms disappear so that it become the management system that covers quality, environment, health, safety, finance, security etc. QW I have also heard people talk of integrated management, is there a difference? DH I don't know what integrated management is. I think the word system fell off along the way. If it were to mean anything, perhaps it means management working together in one cohesive team. I can see this having distinct merits. In some organizations the managers do not work as a team but compete with each other, chase conflicting objectives. I have seen organizations were department managers operate as though they were running their own separate business. For the term 'The Management' to mean anything, all the managers in a business should serve the goals of the enterprise. The role of management is to achieve the business goals and hence they are accountable for the results. If it could be done single handedly, a formal management system would not be needed, but as the number of relationships increases, the management is ever more dependent on a formal management system to enable them to meet their goals. The diagram on the right shows the role of the system in this respect. QW This diagram seems to infer that there is nothing between goals and results except the system. Surely this is untrue. People, equipment, the culture all drive the business towards its goals. DH There is only the management system. However, I need to explain what a system is. Your assertion that people, equipment and culture are not part of the management system is, I assume, based on the belief that the management system is a collection of documents. QW. Well, when we talk of quality systems it seems that what is being referred to is a documented description. It is what the auditors relate to. Also isn't the underlying principle of these management system standards that of 'document what you do, do what you document and prove it'? DH The 'document what you do' cliché has done more damage than anything I know. No this is not a system. It would be like saying that the blue prints for your car are the car itself. The documents describe the system, but they are not the system. ISO 8402 (now ISO 9000), gives a good definition of what makes up a quality system. 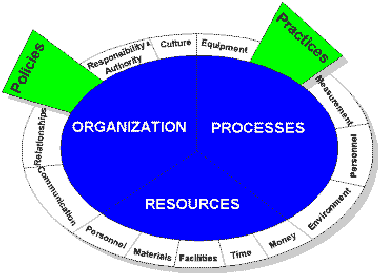 Whether quality, health, safety or environment, the composition of a management system remains fairly similar. QW Your concept of a management system goes far beyond what most people regard as the system. How can you justify this? 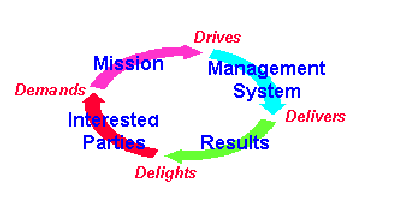 DH To appreciate the scope of the management system, all we need to understand is what a system is, any system. What makes a collection of objects into a system? QW Could it be that they are all connected in some way? DH Yes. A collection of objects becomes a system when the objects are connected together so as to cause a specific result. Hence a system is not a collection of any objects; each object must have a distinct role in the achievement of the objective. If you examine an air-conditioning system for example, all the components have a function but are connected together in a certain relationship so as to provide air at a desired temperature and humidity on demand. Cut one of the wires and the system fails. Disconnect the source of power, or water and the system fails. Place another component alongside the system and it has no effect as there has to be connections which are energised. Dead wires serve no purpose just as a business will derive no benefits from ineffective processes, procedures or people. QW I now understand what you mean. The people, the equipment and even the culture in an organization all have an effect on the results therefore must be part of the management system. Is that right? Author's note: I wrote this before I had read anything on systems thinking or was even conscious of the term.